I would just like to comment on that word Southfield. I personally find it so offensive. I am quite active in community affairs, public schools, am a dedicated downtown shopper etc and consider myself a good citizen. But I was once told that I couldn’t really understand Northfield issues because I live in Southfield – namely near the soccer fields. Northfield is a growing community and we can’t all live in old homes near downtown. But no matter where one lives or does business, we are all members of this community and we sink or swim together. Margaret, my apologies for the delay in your comment getting posted. Bad inbox management! I’d forgotten that the word ‘Southfield’ had that negative connotation. I was just using it as a shorthand for the south Hwy 3 commercial area. I’ve regularly blogged about the businesses there, trying to balance it with my blogging about downtown businesses, so there’s no negativity on my part. My wife and I patronize many of the retail stores there regularly. So I’m glad you spoke up. Can you suggest a better shorthand to describe the area? South Northfield? Northfield South? So. Hwy 3? Get with the program. I learned that in New Orleans, down river is Downtown and up river is Uptown. Using a deep-mapping reference can give substance and sustainability. O’ Brady’s is in Uptown. No one lives in Southfield. The term WAS coined negatively to define the Big Box area on the south edge of town along Hwy 3. Nearest residents of that commercial blight are not being dissed by the use of that term. Those of you who enjoy the commercial explosion at the expense of the historic downtown … are not lessor citizens. Nonetheless the economic stress to this community caused by the coming of the big boxes and the associated in-fill development, back north to Jefferson Prkwy, is very real. If you need to define the South Hwy 3 area as something, but not denigrating it, then I’d call it SouthTown. Finally, if you live in the area just east of the Big Boxes, you’re in Ward 4 … and the other W 4 precinct is up around St. Olaf. So, go figure. In any event we’re all in “this” town together – personally, I welcome your spending anytime downtown. Southfield, SouthTown… Your splitting hairs VIctor. Its still a “seperationist” mentality. Right, wrong, or indifferent, we are still one community. Would “located in the southern retail district of Northfield” be fair and balanced? Last time I checked, the only area south of Northfield was Dundas. JT I don’t disagree with your assessment. I was first responding to Margaret C’s concern that the term applied to her residential neighborhood, and is “negative”. I know it didn’t apply to her neighborhood, and as it was coined, meant to be negative. it was, a snide way of directing one to the new big box commercial area. Yes. But fairness and balance do not apply to big box sites and Historic Downtowns. Finally…. you write “Last time I checked, the only area south of Northfield was Dundas. To that I simply say… unfortunately, southfield is not in Dundas. it is as you point out on the south edge of Northfield on hwy 3 the site of a former cornfield … and is, an unfortunate reality in our community, that many enjoy daily. Ross, seeking peace, wants to call that area uptown (v downtown). I don’t see it as up, but really don’t care – and never frequent that area. I still find it interesting, that these “Micro” restaurants are popping up in Northfield. As a business/building owner, Victor, can you shed some light on this? Wouldn’t economy of scale, and numbers be required to make it viable? I guess the cost/benefit works out, so these folks are coming to town, but it just seems like it would be more risky to open a restaurant where the numbers are not as great as other communities. I remember from prior discussions why Applebee’s is so small. Other commercial chains are coming to Northfield, and the floor plans seem to be smaller to me, than say Lakeville. Do you think that the restaurants are the appropriate size for our market, and that we will see more of these? Right now, I think we have a large skew toward pizza restaurants, so any restaurant that can balance that out is a welcome addition, even on the south end of town. Yes, John, national chains do have different floor plans they use in different markets. Northfield is a tough sell because the numbers are so small — and Faribault is working hard to get its downtown hopping. There’s a new steakhouse there that seats 200 and has a nightclub and banquet space. It’s an exciting venture, but a really risky one. The wave of the future are small ‘local’ chains like Porterhouse and Rudy’s Red Eye Grill and some others run by people in the area. The are in the style of updated 50s supper club restaurants, with limited restaurants, but quality food and service. It seems to me downtown hasn’t begun to tap the local customer base — and more money to fix up stores isn’t the answer. Spend the money on decent online services. Get downtown online, connected to Northfield.org, the News and Locally Grown and the visitors site. E-mail notices of events and sales, better websites and a central web directory, take out food service, online reservations and ordering, you name it and it would appeal to many of us out here. ‘Personal shoppers’ who come to the house and take a Christmas list and make suggestions would be great and I know seniors would love to have free taxi service or volunteers to drive them to do their shopping this time of year. I’m sure stores could do private parties for birthdays and showers…there are lots and lots of options. Holding some ‘downtown’ events at the soccer fields in summer also is a great way to introduce soccer families to what downtown has to offer. For example, I need a couple of small accent tables, and I’d be happy to sit inside during the snowstorm and buy them from a store downtown and pick them up later. I’m also thinking of a couple of antiques that would be nice and some gifts. I’d love to be able to use my laptop webcam to look around the store and ask questions and pick out something. But that won’t happen, so I’ll probably go to Pottery Barn online and get something there. Too bad. Funny, I used my laptop to take my grandsons in California out into the middle of the snowstorm, but I can’t look around a store a few blocks away. Get with the technology or lose to it. And for those who refuse to support the dentists and architects and other locally owned business out this way, how does that square with you wanting us to shop downtown? And after all, where would they have fit downtown? I know the Division Street Dentists really didn’t want to move and change their names but they had now choice. 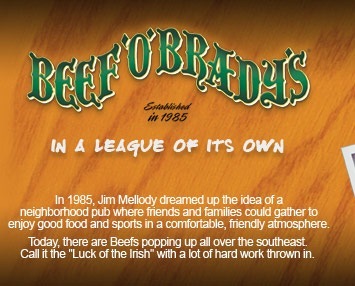 Since the first Beef O Brady’s opened in Tampa Florida in the mid 80s they have put pride in families. The walls are plastered with local sports teams’ pictures, trophies and memorabilia. We take pride in the family aspect of the “Family Sports Restaurant”. We feel that Northfield needs a place that families can go and enjoy a meal with something for everyone from the game on one of our over 25 TV’s (one having nickelodeon all the time), to the family friendly prices, to the game room full of video games. There is something for everyone. There will be family friendly language from the staff and we expect it from our customers. Separate small bar area serving beer and wine perfect to catch the game and grab a basket of wings. There will be lunch specials as well as delivery to those businesses that can’t get out for lunch. 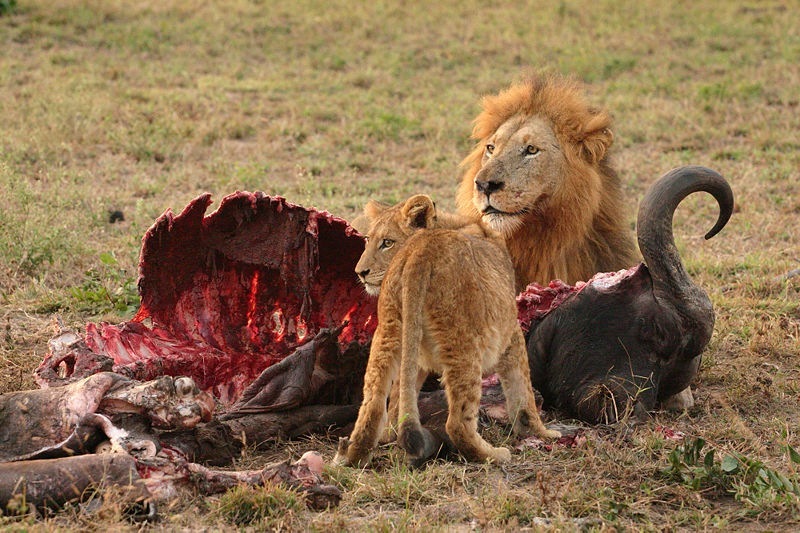 Tuesday night’s kids eat free with a kid’s movie showing on our 60″ plasma in the main dining room. We will also have a party room capable of seating up to 50 and being separate from the seating in the main dining room for a sports banquet or church meeting or whatever is desired. The restaurant is locally owned so we have great pride in the community we serve. We are looking at a mid January opening date. We are now hiring cooks and servers. Applications are available at Rocky Top Embroidery in downtown. Keep an eye in the paper as well as KYMN radio. I can’t wait. Sounds like fun! In defense of the local doctors, dentists, and optometrists…I would patronize more of them, if they accepted my health insurance, dental insurance, and vision coverage. I have a local doctor, and we finally have a local dentist after 4 years of waiting. The one in Lonsdale is good, but that is a LONG haul for an appointment. Vision coverage, alas… I am still working on it. I keep calling around, but no takers. I can get an eye exam, but still have to go to the cities for glasses. I really want to shop local, but many of them will not take certain plans, because the margins are so low, and the companies are so hard to deal with. I agree on your use of technology. I think we need a couple of sharp people to act as a catalyst to get it done though. Downtown is REALLY missing the boat when it comes to marketing and online shopping. I think I mentioned a couple of years ago when this discussion came up, that Ely and Bayfield and a couple of other towns smaller than Northfield and with really seasonal markets, had really capitalized on technology and customer service to build clientele and keep them even when many miles away and in the off season. There are so many options for Northfield merchants, I continue to be surprised that the discussion hasn’t moved forward. With the inordinate attention the Star Tribune has given Northfield, it’s a shame local merchants haven’t capitalized on all the free publicity. The media is handing this town the “next Stillwater/Grand Marais/Ely” title, all we have to do is cash in. John T, I’m not sure what you mean “micro Restaurants”? Anne Bretts’ remarks, make journalism sense… but I fear they mislead, being generalized information, skewed to the bigger market’s growth goals which in the mega-mall world has become a substitute for entreperneur’s sweat equity. I call that “feature style” writing. No doubt, Anne knows the general situation from the large market players’ perspective and has the vernacular to do the PR. I trust you’re not very interested in that kind of growth here. I’d first separate restaurants into categories by “Chains” with deep pockets, and private ventures, such as we see downtown… from Coffee houses (G’by Blue Mon) to the Tavern, Froggy, Chapati, Rube, Cow, etc. I’m not a fan of the chain – they’re ubiquitous , and tend to dumb down the hometown special characteristics of places like Northfield. On the other hand they’re well funded, well advertised and popular – especially with young people and young families. A recent example of the local homegrown struggle is the Ole Store – first, when it closed, for whatever reasons after 15 or more years… it sat idle until it was refurbished with new money and a new menu, to accomplish a new hot spot, thus the new Ole’ reopened summer of ’05. I believe it was unfortunately only successfully running, some 18 months. Given that short time period, you might question the term, “successfully”. Personal problems may have played a major role in the failure of that effort., and high rent was also a factor. It clearly was a pleasant and welcome addition to the restauranting opportunities in Northfield, and should have worked. Didn’t, and that’s at least partly due to the size and shape of the market. Anne, your solutions in part, order by E mail and Take out, in my view are not the style of Northfield’s DT business. While those trendy and state of the art methods may work across the globe… they come from big organizations that can afford fancy up scale brick and mortar addresses … Palm Beach, Water Tower Place Chicago, Edina … These sales may boost the bottom a bit, Northfield’s DT needs on-site sales explosions. I’m not going to quibble with “what works with the internet and what doesn’t… I’m dealing with the barriers in Northfield… that are not virtual. That Ole’ Store owner told me when Perkins opened in the former Ranch House, South Hwy 3, the Ole Store breakfast business tanked! There was no comaprison in quality and taste. Ole Store beat them “hands down” but the public’s perception of the Perk with the big flag ran the local’s breakfast biz into the dunes! That along with health and family problems, as well as the rent, led to the business’s demise. The impact of this failure took its toll on the family. The subsequent status of the space has not been good since that sudden closing in February of this year. That may have changed. Nine months later, I understand it is now being resuscitated with local players… and that’s good. Numbers for cost and particulars of that lease are private, so obviously, any thoughts on that would be speculation. This privacy issue is one that makes “cause and effect” difficult to quantify. I’ve heard that the current rent arrangement is 50% of that which the previous operators paid. Rumors? Who knows? Another recent example of the local homegrown struggle can be read in Norman Butler’s comments just this week on LG. Norman’s comment might lend accuracy to my point of view… that it is not easy putting a restaurant in a renovated building in the historic downtown… especially with market potential and renovation woes standing in the wings. In fact, it’s not easy putting any business in a DT building if renovation is required. After dealing with the former Bagel Bros site empty now for 3 years, my conclusion, is the need for a full kitchen is a deal breaker. The first six months BBros was vacant (Jan, thru June 05) we probably had fifty interested inquiries. Maybe more. Hardly any were for retail – most, for some form of food service . None were well funded – few had any history in the Restaurant business… and none of these inquiries worked out. The two, which we did work with extensively, “walked” from our sincere effort to make a very reasonable deal (in spite of what their version of the effort might be) and to some degree, are now visible on Division Street… the Waffle Shop and the Pizza spot in the old Ideal. Waffle’s development has taken some time… and I’d say, is in a questionable location. Who knows ,maybe it ‘ll soar. The gourmet pizza and wine bar is in some sort of hang-up… or at least it appears so. I’d bet it (the hang-up) is related to finances or redevelopment rigors, or both. Our efforts and interest in supporting either of these in the BB space, was we thought quite liberal. In each case, in the end, we couldn’t come to an understanding with the would-be tenant, we felt was good for our building, fair to the landlord, and also needed in Northfield… even though our offered rent rate was exceptionally low. In one case, the lowest! I’d tell you numbers here excepting I don’t want to be inundated with weak prospects looking for a free rides. Suffice to say we felt we offered real financial support… and in return required bona fide evidence of the tenant’s commitment, experience and work ethic to make it work. And, of course a reasonable idea. It’s the transition from a dream to a reasonable idea that continues to be so illusive. My assessment – now after owning 306 Division Street for 13 years: short of a tenant like Carleton (River City Books) and especially if you’re opening a restaurant located in downtown Northfield, it is clearly best if you own the building – as you’re likely not going to be in a good position if you’re making build-out improvements and paying rent – opposed to retiring a mortgage… especially in this market’s retail climate. In other words, I can only see my way clear to supporting a business by offering it a small or no rent deal for a finite time – and then… only if there’s some advantage to me in the improvements to the building made by the tenant. WE CANNOT MAKE IMPROVEMENTS AND GIVE AWAY THE RENT TOO. There’s other costs: Taxes on the Bagel Bros site alone are $8,400 per year,and rising. The NDDC is working with other communities and state legislators to find a short term fix for that. There is no other advocacy voice for this kind of need. Not from the Chamber, the Council, and not too much from the EDA. It is not uncommon for people coming with high hopes of turning their mother’s meat loaf and apple pie receipe into a destination restaurant… other than that… they have little more in their business plan… and fewer dollars. Are you familiar with Copper Bleu in Apple Valley? $5 million. and now less than 2 years, closed! Food was fantastic, decor stunning… but the “staying afloat” costs were too much. Less than two years! Clearly the immediate attraction in the Bagel Bros space was the misconception that the facility had a true kitchen. That’s still $200,000 away, four percent of the Copper Bleu bath. Still, that’s big bucks for Northfield… and when you start the refurbish, the upgrade costs and code things kick in. So, I’ve rambled on here about my sense of the situation. Other serious concerns I think you (John T) mentioned are… the local numbers. These are effected by population, popularity, price and quality… PPP and Q… as well as seating capacity. So, you need a space sized to seat enough customers to make it work – serving quality food with service and/or panache to attract the numbers… at a price that doesn’t strike fear in the hearts of the locals, and you need to be able to morph all that into creating a destination attraction. Chapati is an awesome success. The food is great, the price not too high and it has achieved the kind of reputation that attracts from out of town. At the risk of offending other restaurant operations, I don’t think any of our others, regardless of their quality, offer anything as unusual. Good food for sure, but not why people might journey to Northfield. It would be interesting to get a comparison of Kurry Kebab’s numbers and Chapati’s, e.g. rent, taxes, seating, pricing for comparable dishes… and then of course profit. That’s the kind of stuff Anne’s article dances around, but there are no hard numbers. Personally, I don’t believe anyone will make a million dollars here in Northfield. But … life here may be worth a million or more in collateral values. As much as Northfield wants the kind of restaurant that I’m thinking of… its ROI will not be off the charts. That’s okay, if the chef owner is really good, into working the floor for the love of the business – has enough energy to sustain years of hard work, and pockets deep enough to go the route until success kicks in. Absolutely… that’s what it’s all about, unless you have a scenario other than big fast dollars, and the chain to back you up. “Right now, I think we have a large skew toward pizza restaurants, so any restaurant that can balance that out is a welcome addition, even on the south end of town. That remark really peaked my interests. I know you’re fully invested in supporting the DT … but I’m curious why you separated the south end of town from going downtown for a night on the town? BIG FINISH: While I’m not in any “final approach” for this landing… in as much as we own 306, it’s been empty three years now, and we’ve two children, both accomplished chefs living in Florida… and we have the ability (not necessarily the money) to put a bistro cafe in the Bagel Bros… have one of the kids fill the role of devoted entrepreneur… and the work ethic to “stay the course” coupled with the professional skills to make it work… and one thing more… the prospect to expand with a supporting dining room overlooking the river at the rear of the Bagel space… we just might go that route. Digression: I can understand why many of the merchants aren’t putting their inventory online; even if they’re tech-savvy, which most of them aren’t, it requires a cash outlay (ranging from $1500-10,000 for website hosting and shopping cart software), plus a time commitment of many, many hours to photograph inventory or scan images, then enter all the detailed information for each item. Then there’s an additional hour a day minimum required to process orders and keep the site updated. That’s a very large thing to ask from an already overworked, understaffed independent retailer – even IF it was guaranteed to break even, which is by no means a sure thing. However, I agree with Anne that many of the local retailers aren’t using the cheap and available technology to the degree that they can, so there’s still a lot of room for improvement. Heck, a camera phone that can send photos of a particular item would be a start. I agree that keeping a full inventory updated is a big task, but most places don’t have to go that far. The daily specials for restaurants and some current sale items would go a long way. I agree with much that has been said here with regard to the internet. 25% of my sales are online orders. Less than 1% of those are local. 99% leave Northfield and most of those leave MN or the country. The investment in time is huge. I set up my website for $100. I pay $15/month in hosting fees. Quite reasonable I think. I add 20 new items each day. Some days I actually achieve my goal. Approximately 15% of my inventory is online. At this rate it could take 10 years or more to get it all online. I ship everything myself from the store. I don’t leave. Shipping is quick and easy when the store is not busy, 5 minutes per package. It took my 3 hours to ship 10 packages today. fuzzy math? I know. customers. Those friendly people who chose to stop by and say hi. Tom Kutula picks up my packages and saves me a trip and a wait in line at the PO (makes me think of Eudora Welty everytime I say PO). I use a lot of software that I barely understand. Tech support consists of me banging my head against the wall. Then I send an email to fellow booksellers around the world who bail me out. I too wish my fellow retailers would set up fancy websites and sell online. I understand why they don’t. The investment is huge. The payoff is small in monetary terms, but can be much larger in goodwill and increased in store sales. Like advertising, it is very difficult to measure. I know I should be doing more online, much much more. My blog is usually out of date. I could use more photos and product reviews online. Time, time, and more time. The college bookstores do it better than anyone I can think of. big investment, lots of pictures and descriptions, but the payoff is huge. Jerry: thanks for this very real , and realistic, POV from one who is doing it all. It’s so good for the general public to understand more of the “plight” of the independant, entrepreneurial retailer … Not enough help, not enough $$, not enough time, and everyone wants to tell you what you are NOT doing right. Thanks for the times you’ve helped me! Victor’s comment #13 above was inadvertently cropped/chopped. It’s now restored in its entirety. Apologies to VS and all. Anne, did you say you want someone to do your Christmas shopping for you? My favorite part of having a gift store is when customers come in and tell me about each person on their list. Then we work together finding fabulous things for each one. It’s FUN, and I’d love to help you! I think it’s hard to choose from all the great stuff here, though, if you don’t touch it and look at it and weigh it against the other great stuff…but if you would like I will pick up your list and pick out and wrap everything for you too–that’s what I do best. Give me a call. I’m here almost everyday from now until 4:00 on Christmas eve waiting. Is anyone here aware that Beef O’ Brady’s has a myspace page and has had for sometime? One more thing, Anne. I was going to pop a brochure about the holiday offerings from BT McElrath that I would be happy to deliver to you, but I couldn’t find you in the phone book. If you call me at the store (645-9131)with an address I would love to put you on my mailing list! I just don’t want to miss this boat!! Mary, sorry, we ditched our land lines a year ago and live on cellphones and the Internet. And I have a love-hate relationship with the latter. It saves huge amounts of time in the car, but I am a slave to my laptop. And Jerry, you always show determination and the kind of creativity that I admire. You two really get it. Truth is that it’s hard for all small businesses to compete, just as it would be hard for me to start my own newspaper or for my friends to do international legal work from here. I now have a compromise that lets me commute part-time and work at home part-time. Others aren’t so lucky. Just because we want to run a business, doesn’t mean the world owes us success. And telling me I have to come in to shop or eat because you don’t feel like doing take-out or online orders explains a lot more the problems downtown than high taxes. Victor, I’m well aware of Copper Bleu — just did a story on restaurants, in fact. The owner of CB was nuts, according to all the experts. He put $5 million into a stunning building, then dumped it in a parking lot of Cub Foods, with no offices, hotels, tourists or others to provide a lunch crowd. That restaurant wouldn’t have made it in an outlot next to the Cheesecake Factory at Southdale, however. He needed to make $10 million a year to break even, not even likely in downtown Minneapolis. I’m sure he was broken hearted, but he forgot this was a business and not his personal dream. Not far away, however, two smart and exerienced partners opened the Porterhouse with no lunch, no brunch, no sports bar. The menu has 13 items, that’s it. The interior is simple but elegant and they’ve got lines every weekend. And it will cash flow. And no, they can’t make the numbers work in Northfield. Ole Store had numbers issues, an owner with personal problems, a location too far from downtown and the highway, and a college with such an amazing food service that students have no need to hike down the hill for food. Do the math. I’m telling you, Northfield has huge potential, but too much is being squandered right now because people aren’t asking the right questions and taking advantage of what’s out there. Northfield has to decide what it wants to be, what it will take to get there — and then do it. I mentioned Grand Marais, Ely and Bayfield last time as small towns that have grabbed success despite high taxes and old buildings and short seasons…They have natural scenic attractions, but Northfield could develop some draws that would bring more numbers to town. Excellent post sir! I was hoping you would share some insight and background as a business owner, and you did so in spades… Thanks! I am not sure why that came out that way Victor, but I wonder if it is due to the costs of upgrading the existing buildings as you discussed. I wonder if new businesses find it easier to move into a space that is a “clean slate” and up to code, so they do not have to struggle with the upgrades. I just wonder if somehow, it has become easier to go into a space south of town. Our family has our favorites. Most of them are downtown. Our family does not do chain restaurants. Some may call it child abuse, but my 9 year old son has never had a McDonald’s Happy Meal. The closest he has come to that was a Wendy’s Junior with a mandarin fruit cup and milk, and that was nearly 2 years ago. He just doesn’t care for it or want it. He has developed a severe addition to Palak Paneer and Samosas however, and we have become frequent visitors of Kurry Kabab. We have tried Chapati as well, and it is very good, but in the end, staff friendliness is what won us over. Jake enjoys the staff, and everyone treats us very well there. They bend over backwards to honor the requests of a 9 year old, when an item is not on the buffet, and treat him as a regular “adult” customer. Also, quite frankly, there are some Northfield restaurants that I would not patronize, even if the meal was free, cooked by the head chef, and served personally by the owner. No amount of advertising or remedial contact is going to change that opinion. (Note, these are from more than one experience at these places.) Others I will not patronize due to cleanliness issues, or prior bad experiences with food or staff, (or both! ), but that is another thread completely. I could blog for hours on the negative experiences that I have had at restaurants in Northfield. There have been some great experiences however, as well. I tend to be very loyal to the restaurants I patronize. None of the Northfield restaurants that I patronize are chains. I believe in giving my $$ to the little guy as much as possible. The last time I was in Applebee’s is when my dad was in town a few years ago, and he took us out after a trip south of the city. It was his spur of the moment decision. There is nothing wrong with Applebee’s. I just find it small and crowded, and I didn’t really like it when it was both smoking and non-smoking. Applebee’s biggest fault is the pushing of alcohol sales. I really don’t care for that, as well as the “overfriendliness” of the staff. I must be getting older, and prefer calm, quiet places, with good unpretentious food. Also, it is the farthest restaurant from the house, so it gets the least consideration by default. I am however looking forward to the opening of Beef’s, and our family will give it a shot. I am curious to see how family friendly is implemented, and what kind of food choices they offer the kids. I apologize if this rambles… Its definately a collection of semi-random thoughts. Thanks for the time. I would like to respond to Anne Comments in post #22. If you feel that the retail owners simply do not WANT to make their stores available online you are serioulsy mistaken. My wife and I own Sweet Pea’s Loft and we would love to be able to list all our products online. But in is just not Financially feasable at this time. We just purchased the store in April and have had to make many changes including putting the entire inventory on our Point of Sale program, Which cost us substantially, not only monitarily, but the amount of time spent is almost rediculious, Knowing that other retailers downtown are still using a pen and paper to register sales in much larger stores with larger inventories, expecting that they get online immediatly is not realistic, Then there is the issue of knowhow, not everyone knows how to get a website up and running, Yet alone to maintain it afterwards. In case people haven’t noticed downtown is full of MOM and POP stores, That offer a unique shopping experience, If online stores is what people want maybe we should all close shop and let the internet orders take over. That means no more displays, no more fun interaction with customers, no more just browsing. Instead we’ll all open up warehouses in our location that are filling internet orders. So to sum it up. We retailers are trying to take the steps that are needed to get our stores online, But we also realize that our bread and butter is our stores and the downtown shopping atmosphere that provides a one of a kind shopping experience. I really don’t think you can get that on the internet. Mr Sweet Pea — my sentiments precisely. I hope you have a bang up Christmas season. What those who herald the internet as the great savior don’t get, is the value of this historic DT. Thanx for being here. You mentioned your loft becoming a wear house – Kiffi’s oft used phrase is: Who’s going to support these museums? As I have pointed out before, very small towns have used these methods with great success. Making fun of reality won’t change it. People like me — and that’s an awful lot of people — just expect a basic effort to meet modern customer needs. I don’t expect you to be totally online. but a website, an e-mail address, e-mail notice of sales, the ability to e-mail a photo of a specific item, that’s not unreasonable. People in the Twin Cities — and in my neighborhood — don’t drive through every day and see the little folding signs announcing events and sales. They need help. And I know it’s tough to compete. I spend a fortune on computers and software and routers and wireless and digital cameras and cell phones and time trying to keep it all running — if I didn’t I wouldn’t eat. I’m a MOM and POP writing business and my customers don’t give a damn how much it costs me because there are 50 experienced and laid off writers willing to take over if my system goes down on deadline. There are sophisticated design jobs I can’t bid because I don’t have the programs or the time and money to become proficient at them. My customers don’t care, they just hire other people. I sympathize completely with you, I really do, it’s just that people here keep asking how to make downtown more profitable, then complain about every suggestion. You can share the cost of a joint e-mail list, with a weekly e-blast of downtown news. You can probably get the News or Rob at the Entertainment Guide to whip one up at a cost that’s quite reasonable to each participant. E-mailing photos is no big deal. I even have a webcam and showed my grandkids my Christmas tree while they viewed from California. Just turned on the laptop and sat on my couch. No fancy technology expertise required. I don’t mean this to sound flip, but you can ignore all of us and that’s fine. It really is. We’ll come downtown once in a while. We’ll just spend most of our money somewhere that thinks what we want is important. Just don’t complain about how bad business when you are turning away customers who would like to buy from you if you’d meet us even halfway. To M/M Sweet Pea… You need to know that there are MANY people in Northfield that believe in the spirit of downtown retail, that thank you for all you do to keep the core, the heart, of our town alive. It may not be thriving at the “top of its game” right now, but hold on, you’re young, the tide will turn and people will tire of the ubiquitous franchises. And when that happens it will once again be time for the “Ma and Pa” retailer, with all the variety, and individuality, energy, personality and friendliness that they bring to their stores. We don’t need the glut of a thousand items all the same, in every iteration of a big box, whether located in Rhode Island, South Carolina, Montana, or Minnesota. We need your own considerate choices of what YOU think the people of YOUR community might like, and your own personal way of running your business; not run by the handbook from the corporate tower. We value your desire to help our town by running your own very personal business model in our downtown. And we should thank all the small downtown retailers, and restauranteurs, who work so hard to make sure that this historic commercial district will survive, and NOT as a dusty, rundown “museum” with boarded up second story windows. Can I agree with both Anne and Kiffi in their most recent comments, or will that get me voted off the island? They both make good points, although obviously not the same good points. I say, good for us on both counts! The closest thing to a “simple answer” for downtown retailers would be a program to reduce businesses’ overhead by some sort of commercial property tax relief that can be passed through to tenants. Don’t ask me for specifics, I don’t write policy, but I’m sure there are some good programs out there we could start from. I give up on this. I applaud that you’re trying to raise awareness of downtown, but folding signs and parties reach such a small number of potential customers. There are college classes that might do some focus groups and customer surveys to see what new approaches might work, there are student interns who might help with e-mail lists, there are tons of media outlets that haven’t been tapped and consumer markets that would love to come. Many of us would have been happy to volunteer to help with promotions as we have with other organizations with great success. But if you think raising my property taxes to lower yours is an answer, you’re sadly mistaken…you will alienate the very people you need and take away money they could be spending with you. Thanks Jon for the myspace mention. We have had that for some time and we have been reaching out that way. If you are interested in our menu it is available on the myspace page as well as on the corporate website. And to answer your question John we have a very large kids menu, one of the largest I have seen. The normal side items on the menu are cole slaw (with pineapple it’s a very good spin), potato salad or chips the same chips we had at DJJD. All of which can be substituted for fries. There are the Beefs Baskets that come with fries. As far as ordering online from us it is not an option at this time. We will keep the myspace website updated with our current events and pictures as well as we will have fax in menus. If anyone has any further suggestions we are open to them. Can I ask of you, why you decided to go with the MySpace website as a “business” presence? Convenience? Ease of setup? Community? Demographics? Engagement of the College crowd? MySpace is good for certain things, but it is not as polished as I would think one would want for a business. I’m not berating it, I am just trying to understand why you went that direction over a simple page on a hosting provider. Again, it works, it just seems to be a different tact than normal. The corporate website at http://www.beefobradys.com/ is nice as well, but not specific to Northfield. Some years ago, five or more, the legislature , in response to growing property tax levels, instituted the State General Tax, which is line # 9 on the property tax statement. If you are only a residential property owner you won’t have a $$ amount on that line; this was done to shift some of the tax burden onto commercial properties. (Legislators listening to SOME voters). This created a HUGE problem for small town commercial districts throughout the entire state, and an added hurdle for small independent businesses. ( It added 4-5 K to our commercial taxes that year on one small building). It was as if the legislature didn’t see the impact this would have, statewide. This is really a huge policy conundrum; I totally appreciate MN’s general policy of backing home ownership, and until more recently, their education system. But does the legislature want to add to the demise of all the outstate small town business districts? Drive around the state and look at which towns are thriving; there has to be a big tourist component of business to be financially somewhat secure, or a regional commercial development. Most small core business districts are holding on by a thread, or, even if they are recognized Historic Districts, proceeding toward the “dusty, run-down museum” category; look at Pipestone, for example. nation of strip malls, feeding off big boxes? Whether or not it is fully realized, this changes the face of our country, and “dumbs down” our quality of life. This is a difficult problem to resolve, needs much discussion from ALL parties affected, and a decision that will not just, once again, swing the pendulum to the other side. Send me an email info@monkeyread.com and I will add you to my email mailing list. No spam, just one or two emails a month highlighting our sales, author appearances or new items and the occasional book review. I’ll send you a coupon just for signing up. 20% off your entire purchase. No email, call 645-6700 and I will mail the coupon. No phone, stop by and I will hand you the coupon. Griff says there about 3000 lurkers each month. Let me hear from you. My apologies to Griff, Tracy and Ross for turning your community blog into my marketing machine. Call it an experiment. I have to disagree with Kiffi’s remark at Post 32. I’ve heard you explain the Statewide property tax this way before, and it’s not correct. In 2001, the state eliminated the general education property tax levy and paid for the basic K-12 formula allowance with general fund dollars. This would have resulted in too large of a property tax decrease for commercial/industrial properties, in the opinion of some legislators. So the Statewide property tax was imposed only on commercial/industrial properties,( not residential or farms) at a specific dollar amount, with the money used for other educational aid. In the past several years, the DFL has tried to freeze the levy rate, rather than the dollar amount, so the business tax would increase with market values in the future. The result of the 2001 action was still a net property tax decrease for commercial properties, even with the new state property tax. If a business property tax went up in 2002, it was probably due to increase in FMV by the assessor. The 2001 decrease has been for the most part neutralized by new property tax levies which have been imposed, by local governments and valuation adjustments. Tom: In response: this will not be able to be made clear by me without charts and back and forth discussion , so maybe the best way is to provide some real numbers, off of my tax bills, for the building that Victor and I own at 306 Division. I would imagine your explanation of the actual steps is accurate, but what I think we were discussing here is more focussed on impact on small town, local business and building owners. In 2001, before the STate General Tax, line #9, the market value on the bill was 223,400. The school levies totalled 1483.35 (.part state enforced, part local). In 2002, the first year the SGT first appeared on my bill, the market value increased to 348, 200. The SGT amount was 2270.80. the school levies were 549.78. That year the total tax bill went down approx. $100. In 2003, the market value went up to 400,800. The SGT amount was 3043.59. The school levies were 776.60. The total tax bill was $11,010. Let’s skip to 2007, for brevity .. In 2007 the Market valuation was 726,000. the SGT was 4896.67. The school levies were 1811.80. ( so now the SGT and the school levies total 6707.47, more than 1/3rd of the total bill). The total tax bill was $18, 612. I do not see how small town commercial is not DIS-advantaged by the state’s shift to the SGT, imposed on commercial properties…. I may be wrong; I’m not a math wizard. By the way, Congratulations on your judgeship! You will look straight out of Central Casting with that distinguished white hair and black robe…. Tracy has a new blog post on this property tax discussion. Kiffi, I’ve copied your most recent comment there, as per Tracy’s request. Tom, Kiffi and anyone else, please continue the property tax discussion there, not here. Mary, here’s what I mean. Two days in meetings, in the car, home too late too call. Now I’m in San Diego through Sunday. E-mail would be great…but I’ll give it a shot here. I have young granddaughters, one collects nutcrackers and the second snowglobes and two more who will have collections of some kind. So I need a nutcracker and a snowglobe and an angel (to start a collection) and an idea for the fourth — penguins or fairies or something…Something pretty but not too spendy, as they say. Anyone with ideas just post them here or e-mail editoranne@yahoo.com. And Jerry, excellent offer, sign me up and I’ll add my husband when I get a minute. Gotta run, going to Disneyland. We actually got the idea from another partner in Texas. He had one and said it was a great way to reach out to the local community. Just plug in your zip code and there you go hundreds of people that live in the community. We checked it out and were surprised by the number of Northfield residents on there. 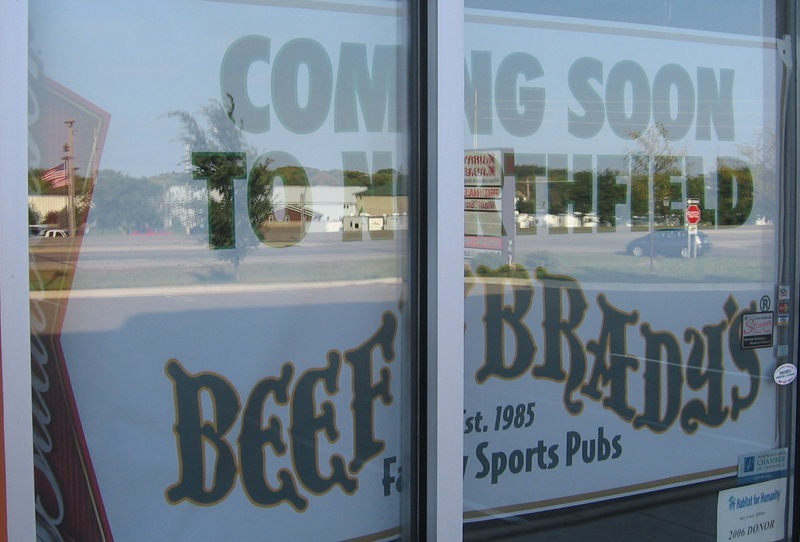 Since the Family Sports Restaurant concept is new to the community we couldn’t just say “Check out our Beef O Bradys” and expect people to flock knowing exactly what we were. We also decided to go the myspace route because of the ease of set up, it’s so user friendly. We update it when we can with our pictures and such as well as the menu. As you stated the corporate website is not specific to Northfield at all. It does go into the corporate background however not really what Tina’s Beef O Brady’s is. Our Beef O Brady’s is not a carbon copy of any other. Every one is different, we had the flexibility to take some things we saw from others we visited and say that would work in Northfield and that wouldn’t. You just don’t get the feel from the corporate website. We have gotten alot of positive things from the myspace website, possible employees, local memorebelia getting the word out there to people who may not have known about it. It has turned out to be a very positive thing. Hello everyone, my name is Marc and I just started reading and leaving comments on this web page which I find very interesting. I moved to northfield 4 year ago and we love it; it is a great place to raise kids. I read some of the comments above and specifically about the restaurant options in town. It is true, there is just a few options to eat but we need to look more. have any of you tried Northfield Golf Club’s restaurant?. We think is very good and they do not pretend to be someone they are not and even so when at times they have problems with service, the food and ambiance take over for it. They do a very regular golf faire but with a twist and magnificent specials; their chef has years of experience on the field and he is still very young 932 or 34 years old I think) and has worked overseas, Mexico and here in USA. They really accomodate evryone and the do anything they need to do to acomplish thei goals. Once I had the idea of opening a restaurant in town and I spoke to that chef and vene offered him a job and he recomended me to save my money for now,”if you really think you are going to make yourself millionaire by owning a restaurant/bar think twice”. After a few days I had another little meeting with him and asked why wouldn’t he open his own restaurant? and he said he tried but things didn’t work ot quite the way he wanted so he put his project on hold (which is very, very good by the way, it is a shame he does not want to continue with it now) and talking about the restaurant scene and all the openings anc recent closings he said that unfortunatdley a lot of people goes into this business without conciously knowing what are they getting into it, what does it takes to really run a food operation sucesfully form time away from family, holidays, summers and overall experience n the field. I agree wiith him, not anyone with a good mom’s or pap’s recipie can make a restaurant work, a recipie is just one small piece of the puzzle. If any of you guys have any questions about how make a restaurant work go to Northfield golf Club and ask the Chef (which is also the Food and Beverage Manager now), before he ariived the clubs food service area reported a revenue of $550,000.00 for fivr years straight without movement and after he arrived (2005) to today he brought the revenue up $840,000.00 combined for food and beverage and he is aiming for the million dollar mark; he must be doing something right, it can be done!!!! we juts need the right person, concept and commitment to make it work. By the way go and try the place, it is a good alternative for everybody, specially on friday nights when the have a hughe live pasta bar where you choose your own ingredients and to chefs coook the meal infront of you. just a thought. You’re right, the Golf Club is just wonderful and the chef is fantastic. We have Rotary every week and he does magic with a limited budget. I’ve had lunch a few times as well and it was great. Marc, I’ve temporarily removed your comment about the Golf Club, as you didn’t include your last name and your email address bounced. Contact me and I’ll put it back. Thanks, Marc. I’ve restored your comment #39 above. FYI, the Northfield Golf Club has a website but it’s not easy to find via a search because they use a 3rd party host. http://www.northfieldgolfclub.com redirects. Hey Tina, let us know when Beef O Brady’s is going to open, will you? Beef ‘O’ Brady’s is now hiring and will be open for business on Monday January 21st. I don’t see the obvious question here. Did the proprietors of the Northfield Beef ‘O’ Brady’s look at or pursue any downtown Northfield locations. If not, why not? I still believe, that in addition to rationale that Victor provided, parking downtown is an issue for downtown Northfield. The Chamber and council can display all the studies you want by some professional suggesting that parking is sufficient but all you need to do is ask both frequent visitors of downtown and those who don’t get downtown much what they think some of the challenges are for downtown and you will hear about parking. I did for seven years as a business owner and I’m sure the problem has just increased since then. This issue would be of particular concern to a restaurant. You potentially have dozens of cars needing to park near the restaurant to accommodate the patrons. Without adequate parking, consumers will not come. It’s really that simple. Once you have more dining establishments downtown, retail will increase. Has anyone read the book Why We Shop? Everyone interested in downtown Northfield should and understand consumer behavior. Dining, entertainment and retail go hand-in-hand and support the other and it all begins with adequate parking. Now I know the alternative transportation advocates probably don’t like the idea of more cars downtown but it’s the most probable solution for increasing business downtown and attractting more businesses. The city needs to step up and examine the parking issue once again. I really like the idea of neighborhood business areas and our neighborhood is bustling with homes, offices and business full of people who need to eat. I think this will be a nice addition to our neighborhood. That doesn’t mean we won’t eat downtown, but we are a community with many great places and neighborhoods that should be working together and supporting each other. I just stopped by the area before church for Coffee, and looked in the window. The restaurant looks great, and I visited with someone who stated that they indeed would be open next Monday. Of course, there is still much to do. On another note, I was in James Gang for coffee, and all the personal items of the Spaldings have been removed. Apparently, the business has been sold… does anyone know more about the sale? It’s true, the Spaulding’s have sold James Gang Coffeehouse & Eatery. Joan blogs about their reason for selling on the Hideaway website (they still own that location). That said, I am pleased to announce that my wife Melanie and I are the new owners. Please stop in and say ‘Hi!’ We’re looking forward to seeing you at the Gang for the same great coffee, food and service. As a business owner of a food production and retail facility in Northfield that is neither downtown nor in the south Northfield development (are we then in mid-town? ), one comment that many of our customers pass on to us is that they like where we are located because they know they can park at our bakery. We would love to be downtown, but our location is where the brick oven was built in 1996. When we first bought the bakery, we had to focus on turning this business around. It took lots of energy, money, and hard work, but, with the help of our employees and the support of our customers, we were able to do so. The Brick Oven is a Northfield treasure and a rarity for any town, but it is in our town. We wanted to keep this business here. Once the business was turned around, we had to focus on making the business profitable. And we have also accomplished that. We really have to weigh the cost of a move against what we would gain if we moved downtown. Right now, we have chosen to stay where we are and continue to give our customers the best product and service that we can provide at our location. We do have a website and try to keep it as up to date as possible. Customers can call the bakery and place an order by phone to either pick up later in the day or on the day they wish, or, for a fee, we do make deliveries. The reason we do not take orders on the website is that I do not always have time to check the website until later in the day. It is better for our customers to call. We will be updating our website in the next couple of months and adding photos of our products (if I can just remember to take the camera to the bakery). We do appreciate Northfield very much and the wonderful support everyone has given us. Our business would not be here if it were not for our customers. Debra, your treats are great and as soon as my annual resolution fails, I’ll be in. You bring up an important point, that there are wonderful businesses and committed business owners all through the city and all of them deserve our support and encouragement. And at the risk of jumping threads, having such a great diversity of businesses throughout the city is one of the things I like about Northfield.